Accrington strengthened their position in the play-off places with a hard-fought win over struggling Dagenham. Sean McConville nearly gave the visitors a half-time lead, but his firm header cannoned off the crossbar. With just seven minutes to play, Billy Kee fired home from close range after his first effort was blocked by Dom Hyam to put Stanley ahead. Dagenham pushed for an equaliser, but Accrington comfortably held on to secure all three points. The result meant the Daggers are now nine points from safety, while Stanley sit comfortably in fifth place, seven points clear of Wycombe, in eighth. Dagenham manager John Still told BBC Radio London: "The boys have competed, as they have done, against a side that's going for the play-offs. "At the end of the day it's always about the same things. It's about the two boxes; we should have been 1-0 up at half-time. "Our confidence isn't high but we've competed brilliantly." Match ends, Dagenham and Redbridge 0, Accrington Stanley 1. Second Half ends, Dagenham and Redbridge 0, Accrington Stanley 1. Andrew Proctor (Accrington Stanley) wins a free kick in the defensive half. Billy Kee (Accrington Stanley) is shown the yellow card for a bad foul. Attempt blocked. Joss Labadie (Dagenham and Redbridge) right footed shot from outside the box is blocked. Corner, Dagenham and Redbridge. Conceded by Tom Davies. Substitution, Accrington Stanley. Andrew Proctor replaces Scott Brown. Goal! Dagenham and Redbridge 0, Accrington Stanley 1. 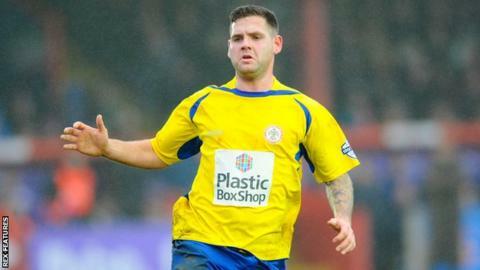 Billy Kee (Accrington Stanley) left footed shot from the centre of the box to the bottom right corner. Joe Widdowson (Dagenham and Redbridge) is shown the yellow card for a bad foul. Shay McCartan (Accrington Stanley) wins a free kick in the attacking half. Substitution, Dagenham and Redbridge. Ashley Chambers replaces Matthew Cash. Attempt missed. Christian Doidge (Dagenham and Redbridge) right footed shot from outside the box misses to the right. Attempt missed. Matt McClure (Dagenham and Redbridge) right footed shot from the centre of the box is just a bit too high. Matt McClure (Dagenham and Redbridge) wins a free kick in the defensive half. Substitution, Dagenham and Redbridge. Matt McClure replaces Jamie Cureton. Delay in match Tom Davies (Accrington Stanley) because of an injury. Attempt missed. Scott Brown (Accrington Stanley) right footed shot from the centre of the box misses to the right. Attempt saved. Tom Davies (Accrington Stanley) header from the centre of the box is saved in the centre of the goal. Corner, Accrington Stanley. Conceded by Justin Hoyte. Corner, Dagenham and Redbridge. Conceded by Matty Pearson. Foul by Dominic Hyam (Dagenham and Redbridge).